I don’t have any sales figures, alas, for my BookBub promotion for Dover Beach. But I do have some sales rankings. The book is ranked #135 on the Barnes & Noble site. On Kobo, which I never visit, it’s ranked #15 in the Science Fiction category. This seems promising! 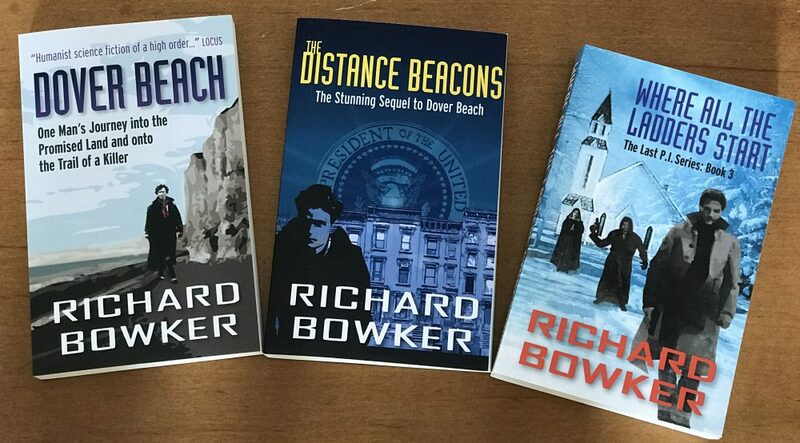 What is also promising is that the book’s very fine sequel, The Distance Beacons, has also moved up from about #270,000 on the Kindle store to about #60,000 (on Barnes & Noble, it’s around #15,000). The hope, obviously, is that people will gobble up Dover Beach, and then quickly move on to the sequel. After that, they will be ready to move on to volume 3, which I’m close to finishing if I’d just quit blogging for a while. The President is coming to town and Walter, the one and only private eye, isn’t given an opportunity to say, “No!, when the government requests his services after threats are made against the very distinguished official. From the beginning, nothing the government does makes sense (LOL) but Walter keeps chipping away at the case, in between repeatedly being beat up and thrown in jail. The closer he comes to solving this complicated case the worse things get for him. You will love this unusual story and get to spend more time with Walter’s menagerie of friends. You will also bellow out a few good laughs at poor Walter’s expense. I can’t wait for another book about this private eye of the future! This entry was posted in Ebooks and tagged authors, Bookbub, Dover Beach, ebooks, science fiction by Richard Bowker. Bookmark the permalink.